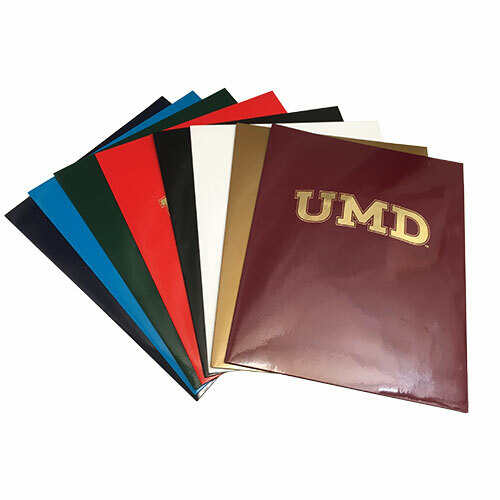 Glossy laminated folder has foil embossed UMD graphics on the front. Die-cut inside to hold business card. Please select option for 2-Pocket UMD Folder. 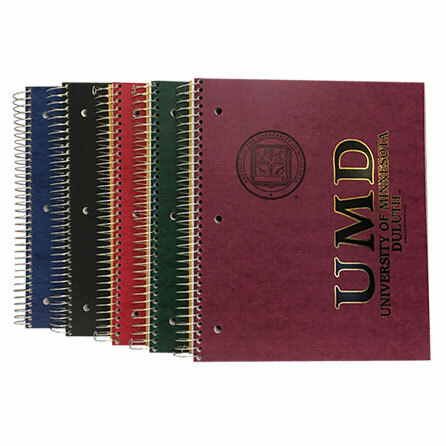 Light-weight folder has foil embossed Minnesota Duluth graphics. Die-cut inside to hold business card. 4 subject spiral notebook. 8.5" x 11", college-ruled, 200 sheets. Foil embossed UMD graphics on the front. Made in the USA. Quad Ruled Paper. Made from recycled paper products! 80 sheets. Made in the USA! 3 subject environotes spiral notebook with sugarcane paper y Roaring Springs. Producing sugarcane paper saves over 60,000 acres of forestland every year! 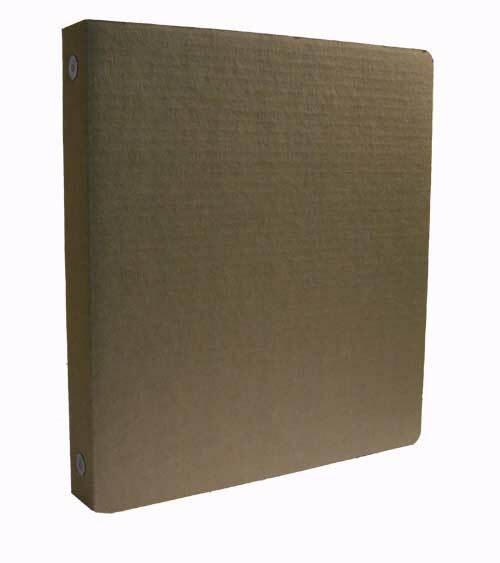 College ruled paper, 120 9"x11" sheets and one double pocket. Made in the USA! Available in green, blue, red, and black. Please list your color preference in the "customer notes" field at checkout. 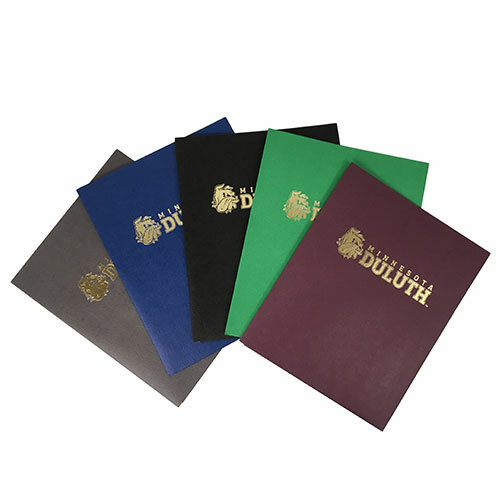 Please select option for Spiral Notebook from Rite in the Rain 3x5. University of Minnesota Duluth Padholder. University of Minnesota Duluth in embossed lettering on front. Inside front cover has storage pockets. Includes legal pad. Made with Recycled materials. Perfect to draw all over! Bulldog Head and University of Minnesota Duluth logos screenprinted. 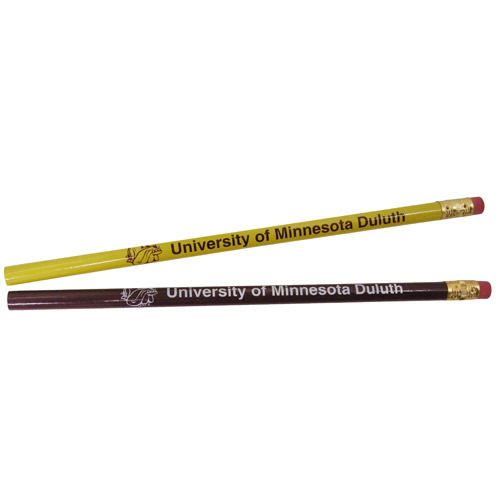 Maroon pencil has gold imprint, yellow pencil has maroon imprint. Please indicate color choice in comment box at checkout. Ballpoint pen with brushed finish. UMD logo screenprinted on pen barrel. Black ink. Available in gray, red, blue, and gold. Please indicate color choice in customer notes box at checkout. This 5 1/4 in long metal All-Weather Pen writes on wet paper and upside down in temperatures from -30F to 250F. The ink won't leak, evaporate or blow up in your pocket! Pressurized cartridge. Made in the USA!